Nova is flying over New York City, pondering his unemployment status and newly enhanced powers, when his helmet picks up a police emergency near Yankee Stadium. As he arrives, Nova finds a trio of armored soldiers waiting for him! As the soldiers begin firing, the hero uses the opportunity to test his new Helmet-Scopes. The scopes allow Nova to analyze an energy's wavelength and confirm that his Energy Absorption Power can tolerate the energy. Unfortunately, Nova doesn't have the experience to activate the Helmet-Scopes and decides to attempt the energy absorption. Taking a full blast from one of the soldiers, Nova does absorb the energy. However, Nova's body can't contain it and he releases the energy back at the soldiers. As the light from his eye blast clears, Nova find that the three soldiers have disappeared. Nova wonders if he had accidentally disintegrated them. We find that the soldiers hadn't been killed but had teleported themselves to safety. The 3 soldiers, Kre'Shje, Fath'Raj & Shy'Tharra, are warriors of the star-spanning Shi'Ar Empire. They appear to be testing Nova as part of a fact-finding mission. To complete this stage of the mission, the three warriors use their computer to provide them with a full history on Nova. Meanwhile, Nova returns to the New Warriors' headquarters, the Crash Pad. The Crash Pad is also Rich Rider's residence while he is looking for a job. After fiddling with the Nova costume's Tesseract Release (it changes the costume into street clothes), Rich calls his girlfriend, Laura Dunham. Laura tells Rich that she is cramming for her Yale midterms. During this conversation, we find that Rich is meeting his old high school friends for a reunion. Rich meets his friends, Bernie Dillon, Roger "Caps" Cooper and his old girlfriend, Ginger Jaye, at Uncle Fudge's. While they are discussing Ginger's recent engagement to a veterinarian, we are given the impression that something is wrong in the relationship. Suddenly, an energy blast destroys the front of Uncle Fudge's! The Shi'ar warriors have returned to test Nova once more. Nova is more than happy to give them a fight due to the harm they've caused his friends. During the battle, Nova discovers another aspect of his uniform. The Nova helmet can translate alien languages into English! After knocking their helmets off, Nova discovers that his armored foes are Shi'ar. The young hero is confused by the revelation as the Shi'ar have always been allies of Xandar. While pondering the news, Nova is struck by the Shi'ar's greatest warrior, Gladiator! Gladiator and Nova have a fierce battle that results in the destruction of city blocks! To protect the innocent, Nova grabs Gladiator and pulls him into space. Furious, Gladiator unleashes energy eye-blasts at Nova. Nova uses his Energy Absorbtion Power to contain the blasts and releases the energy back at Gladiator! Gladiator and Nova are both stunned by the blast. 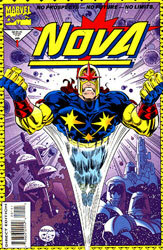 The Shi'ar warrior admits that Nova is truly a Centurion worthy of the powers given to him. The two combatants are teleported to a Xandarian ship in Earth orbit. Xandar's Prime Commandant, Adora, reveals to Nova that the fight with the Shi'ar warriors and Gladiator had been requested by the Shi'ar Empress, Lilandra. It was all a test to prove Rich's ability to handle the Nova powers. 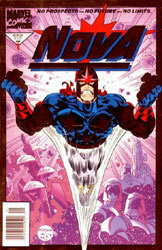 We are also informed that Nova's former adversary, SuperNova, is now Adora's Centurion Sector Coordinator. Rich is furious with Adora for doubting his worthiness after all he has done for Xandar. After a lengthy discussion with Adora, Rich calms down and even appreciates having been tested. After giving Gladiator a final punch and Adora his farewells, Nova returns to Earth and celebrates his 21st birthday with his family and friends.